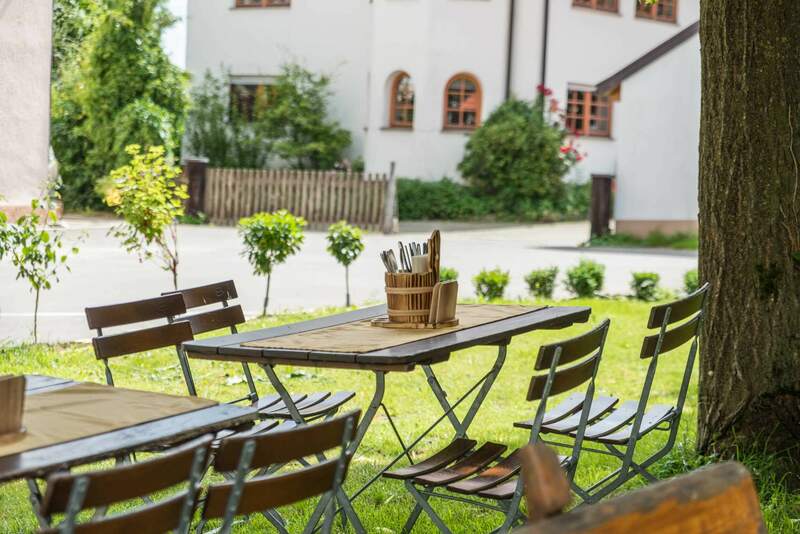 The Hotel Restaurant Hörner’s Landgasthof is a Swabian inn that offers traditional local cuisine. 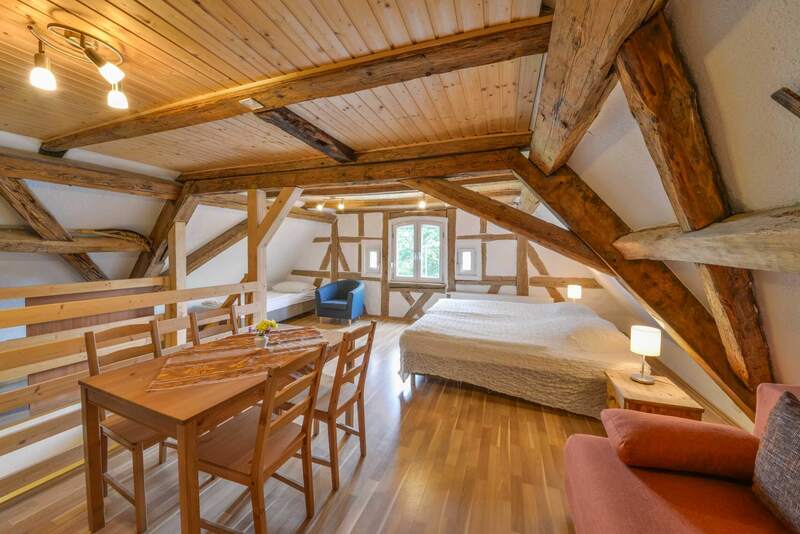 It is located in the beautiful town of Türkheim in the administrative district of Göppingen in the Swabian Alb. The Swabian Alb is known for its unspoilt landscape and the area around Türkheim, which features nature reserves and bird sanctuaries, such as the Eybtal, the Autal, and the upper Lonetal. The historic city of Ulm and the town of Geislingen are impressive places to visit for those looking to experience the culture and architecture of the area. This makes the Hörner’s Landgasthof an ideal place for bus tourist who are passing through. Experience the special charm of our comfortable single, double, and three-bed rooms. We adjust to your personal space requirements! The extraordinary design of our rooms adds a special something. 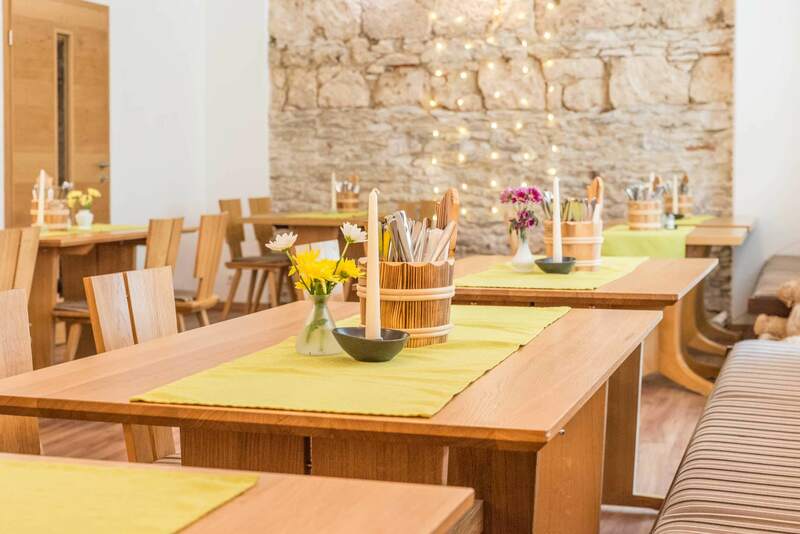 The restaurant in Hörner’s Landgasthof is tastefully furnished in modern southern German country-house style. 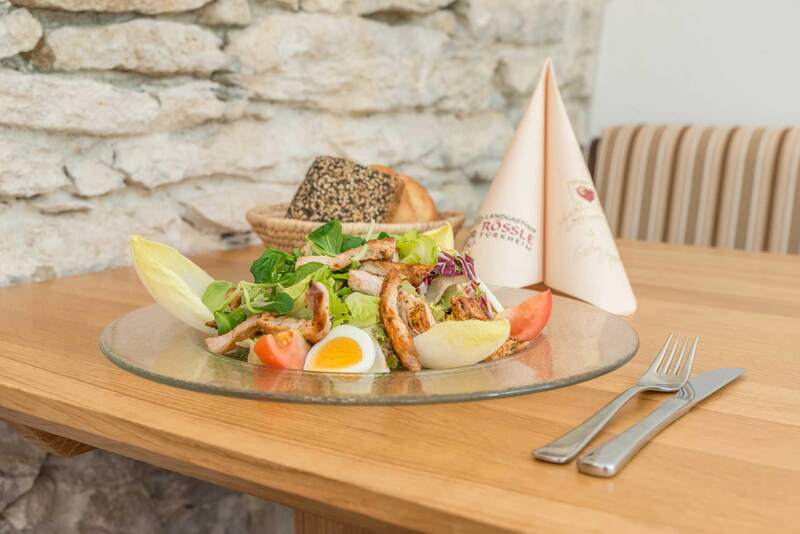 We serve authentic Swabian cuisine and seasonal specialties prepared from quality ingredients. On sunny days, the beer garden behind the house invites guests to eat and drink outside. Enjoy the sunshine and breathe the fresh air of the Swabian Alb. Breakfast at the Hörner’s Landgasthof is included in our business package. Every day, we serve fresh, high-quality products that are often also purchased from regional producers. Our catering service provides all food and drinks for your event that you could wish for. Our comprehensive service includes the preparation of dishes, buffet service and disassembly. We offer the perfect service for all guests. 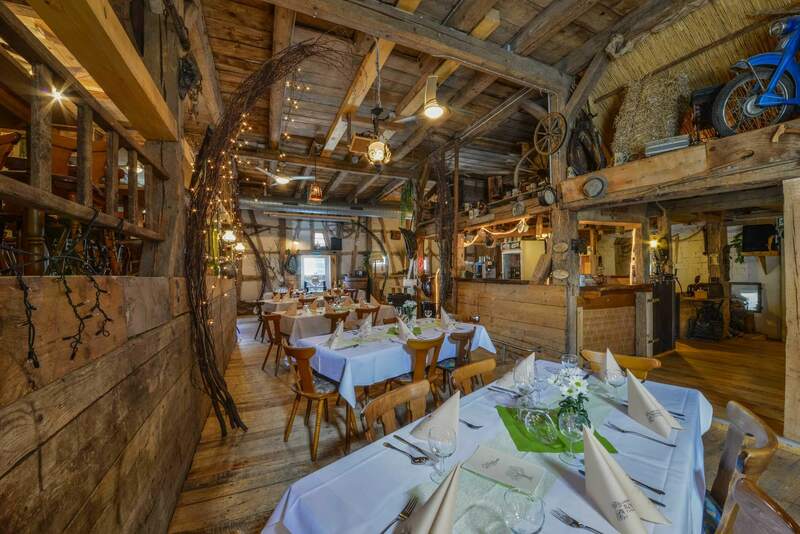 With great food and lots of space in our restaurant and our barn, the Gasthof Zum Rössle is the ideal place for parties and celebrations. As the lucky owner of a campervan or a caravan, you can use one of our 4 lovely pitches with power connection. They are located just a few steps from the house. 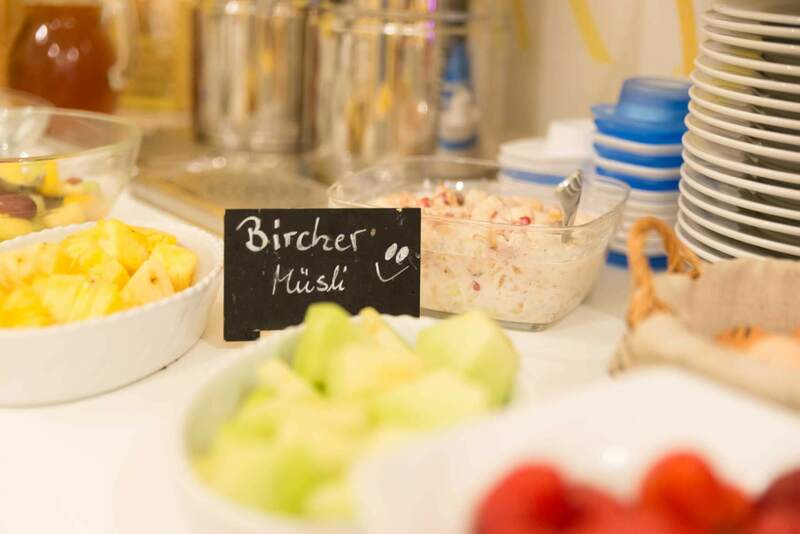 Our delicious and healthy Swabian breakfast is not only available to the great price of €8 per person. It is also the first enjoyable experience of the day. The Hörner’s Landgasthof is our answer to the boring restaurant landscape. We are not an uninspired and dull place – we counter boredom with vigor and creativity. We don’t spend our time meticulously optimize each price, but rather focus on the quality of the ingredients and their ideal preparation. We refuse to practice the pedantry and stagnation that have become custom in our sector. We want to offer all our guests an experience that is tangible, emotional, and modern. We refuse to mass produce and to offer soulless standard food and service. Those are all things that nobody needs, but they are far too often what you get. We want to change this! It stops right here! We are ringing in a new era. Our formula? E² + I + C = Exciting, extraordinary, infectious, & colorful. We want to offer our guests an experience that they don’t get anywhere else and we take great care to put our ideas into practice in a very customer-friendly way. We are authentically Swabian and most modern at the same time. Experience our qualities for yourself and book a table or a room at the Landgasthof Zum Rössle today.